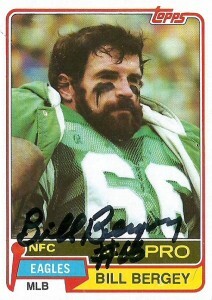 Bill Bergey was a monster middle linebacker with a motor that never quit. After setting multiple records for tiny Arkansas State, he’d be drafted by the Cincinatti Bengals in the second round of the 1969 AFL draft. He immediately contributed to the team as a starter, and was named an AFL All-Star and Sporting News defensive rookie of the year, after recording 2 picks his rookie season. He continued playing with the Bengals through 1973 when he had 3 picks and 3 fumbles. After the season, the upstart WFL was picking off established and upcoming names from the NFL to pepper its rosters. Bill Bergey signed a futures contract with Jack Pardee‘s Florida Blazers, and then was promptly sued by the Bengals for breach of contract. The NFL ended up losing in court, and Paul Brown traded the rights of Bergey for what seemed an exorbitant amount at the time- two first round draft choices and a second rounder to the Philadelphia Eagles. When Bergey quickly figured out that the Blazers were all fuzzy math, he made the correct choice and returned to the NFL for the 1974 season. The Eagles trade immediately paid off. Bergey solidified the center of the ‘Gang Green’ defense for Philadelphia, and his ability to read and react quickly and heat seek out ball carriers, led him to set the team record with 233 tackles in one season. 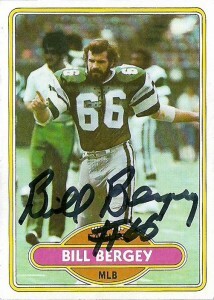 Bergey also set the NFL record for most interceptions by a middle linebacker in a season with 5 in 1974. He’d follow that up in 1975 as he led the league in fumble recoveries with 6. 1977 saw a switch of defensive philosophy for the Eagles, and the 3-4 was in order. Bill shifted inside to left inside linebacker and didn’t miss a beat recording 4 picks and 4 fumble recoveries in 1978. Over his time with Bergey, the Eagles were a dominating force in the NFC East, and they’d reach the Super Bowl in 1980. He’d retire in 1981. Bill was inducted into the Eagles Honor Roll in 1988, and the Philadelphia Sports Hall of Fame. (The Bengals also consider him one of their best defensive players ever too.) He remains popular with fans of that era, and has gone into color, and radio game commentary for the Eagles. With surprising interception numbers that look like a defensive back, its disappointing that there hasn’t been a stronger case made for Bergey in the HoF at least as a ‘seniors’ candidate.